Who loves chocolate and salt? I’m putting my hand up to that one and salted caramel too of course. Continuing on my salty journey from the salted caramelised almond chocolates I made for We Should Cocoa, I couldn’t resist making these salted butterscotch chocolate fondants. 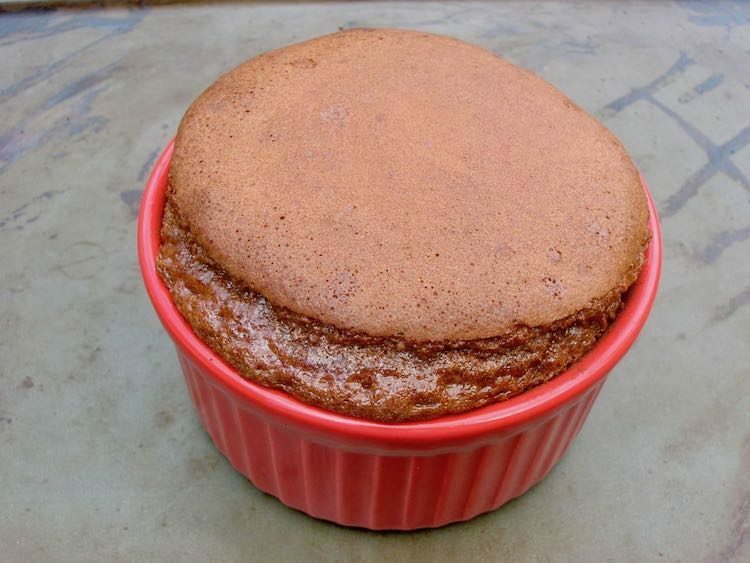 This month’s Classic French theme is chocolate fondants, otherwise known as chocolate lava cakes. The trick is to cook them just enough so that they are cake-like on the outside, but with satisfying pools of molten chocolate running out when you cut into them. I had a bar of salted dark chocolate to hand and as I’m partial to that particular combination, I knew the chocolate fondants I was going to make would be salted something or other. What about a recipe for molten chocolate cakes I pondered. Something like the one found in the French classic Cooking with Chocolate edited by Frederic Bau would be the thing. I halved the quantity and made a few other changes, but in essence this is, vraiment, une recette classique Française. In order to make the salted butterscotch flavour for my chocolate fondants, I decided to use dark brown sugar and mesquite. Mesquite is a superfood and I always like to have something healthy in my bakes, even if they are incredibly decadent. You could just as easily use maca or lacuma powders. For the dark chocolate, I used the Lindt Touch of Salt I recently reviewed. If you don’t have any salted chocolate to hand, just use ordinary dark chocolate and add a pinch of sea salt to the mix. My kitchen cupboard only runs to three ramekins. There was enough mixture left over for a 4th, so as I didn’t have anything to cook it in, I very naughtily polished the remains off. Oh, it was so delicious. The brown sugar and mesquite worked as I’d hoped and produced a really good salted butterscotch flavour. The same cannot be said for my turning out which ended in disaster at the first attempt, so I didn’t try with the other two. They tasted fabulous anyway and we all enjoyed a molten middle. CT, on his return from the daily grind, seemed to cheer up no end when he knew what was on the menu. Butter four ramekins and dust with cocoa powder. Melt the butter in a pan over very low heat with the chocolate. Leave to cool a little. Whisk the eggs and sugar using electric beaters until thick and tripled in volume. Sift in the dry ingredients and fold in as carefully as possible so as not to lose the air gained by whisking. Spoon into the prepared dishes. Leave to cool for a couple of minutes, then run a knife around the edges of the fondant and turn out onto plates. Eat straight away so that you get pools of molten chocolate running out when you cut into them. Can be made in advance up to the point of placing the mixture in the ramekins. Keep in the fridge until ready to bake. You may need an extra couple of minutes cook time. 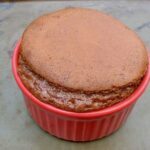 I’m entering these salted butterscotch chocolate fondants into Classic French the monthly theme from Jen of Blue Kitchen Bakes and this month hosted by Claire of Under the Blue Gum Tree who has chosen that most luscious of desserts: chocolate fondants. 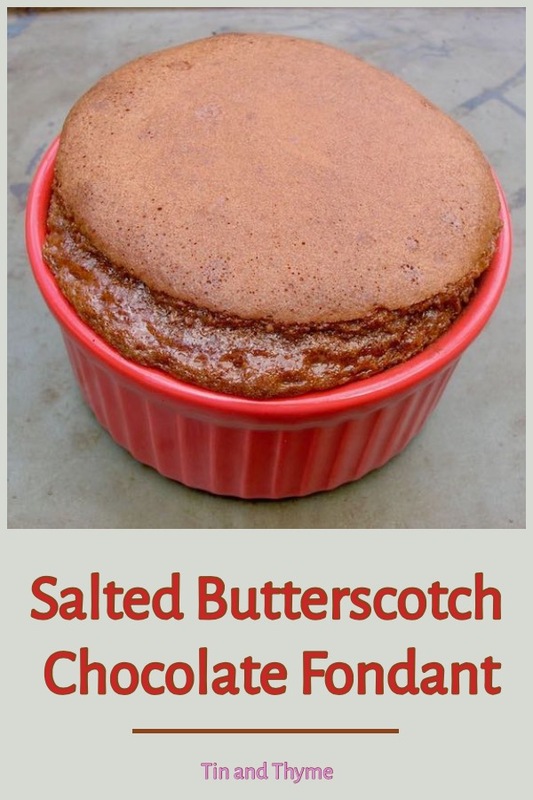 Salted Butterscotch Chocolate Fondants. PIN IT. What form does your mesquite take? The mesquite I have is large chips for smoking on the barbecue! I get it in powder form from health food shops – meant to have all sorts of good properties of course! It does have a nice caramel / buttersctoch sort of flavour, but I only use it in small quantities. I’ve not heard of it being used as you do. Always good to learn more. Ah! This http://en.wikipedia.org/wiki/Mesquite tells me that you are using the ground beans, whereas I am using the wood. I am glad I asked! The splinters would’ve ruined it. No to splinters in the fondants please! But thanks for the link, I knew about the food bit – obviously, but not about the properties of the wood. Interesting. What a creative and beautiful sounding flavour combination for a fondant. I would love to try these so I’ll have to see if I can track down some mesquite. Shame they didn’t turn out but at least you’ve got a really lovely gooey centre there. A brilliant entry for Classic French, thank you. I simply adore that ‘turned out’ picture… it’s really made me chuckle… I bet they tasted simply divine! Choclette – your recipes always make me feel naughty but nice! lol! Thanks Katie – having one waiting for me on my return to work is a lovely thought indeed. drool! I really like the twist of flavour combination you have used here, bookmarked for the weekend methinks! I really like the sounds of it. Yes, I wouldn’t even mind polishing off. And I had a 3rd one just waiting for you Chris. That looks amazing Choclette! Even the photo of the one which didn’t turn out well, it makes it look even more indulgent/decadent!